Cryotherapy, also referred to as cold therapy, is a procedure used to eliminate tissue of both benign and malignant lesions through the process of freezing and re-thawing. In this technique, the body is exposed to extremely cold temperatures for several minutes. It can be administered to one area or the whole body. Localized cryotherapy can be done in different ways, such as with the use of ice packs, ice massage, coolant sprays, ice baths, and even through probes administered into tissue. On the other hand, a whole-body cryotherapy is done through the immersion of the body in extremely cold air, between negative 200 to 300 °F, for between two and four minutes. The individual will stand in an enclosed chamber or a small closure that surrounds their body, but has an opening for their head at the top. For cryotherapy, liquid nitrogen is the most commonly used freezing source. It is mostly used in medicine fore the treatment of different types of skin lesions, the treatment of dysplastic or precancerous tissue of the uterine cervix, and the treatment of some prostate cancers. One of the health benefits of cryotherapy is that it can help with muscle pain relief and some joint and muscle problems, such as arthritis. Moreover, it can help promote quicker healing of athletic injuries. Another benefit of this treatment is that it can support the process of weight loss. Theoretically, being cold forces the body to work harder to stay warm. Cryotherapy may also reduce chronic inflammation which is associated to health problems, such as cancer, diabetes, depression, dementia, and arthritis. It can also prevent the development of cognitive decline as it decreases inflammation and oxidative stress linked with dementia, mild cognitive impairment, and other age-related forms of cognitive decline. Since it can reduce inflammation, it could treat mental health conditions that are associated to inflammation, such as depression and anxiety. The extremely cold temperatures in whole-body cryotherapy can cause physiological hormonal responses, which includes the release of adrenaline, noradrenaline, and endorphins. This can positively affect those who experience mood disorders like anxiety and depression. Another inflammation-related condition is eczema, which is a chronic inflammatory skin condition that cause itchy patches of dry skin. A small study of people with eczema tried cryotherapy and many of them saw improvements in their eczema symptoms. However, some of them reported frostbite on small areas of the skin. Cryotherapy may also reduce migraine headaches. It works by cooling and numbing the nerves in the neck area. This treatment may also numb nerve irritation and help treat pinched nerves or neuromas, chronic pain, or acute injuries. Although this treatment can decrease unwanted nerve irritation, it can sometimes leave the tissue affected with unusual sensations, such as numbness or tingling, or with redness and irritation of the skin, which are temporary. The body systems supported by cryotherapy include the muscular, skeletal, immune, nervous, endocrine, and integumentary systems. Cryotherapy, also known as cold therapy, is a treatment in which parts or the whole body is exposed to extremely cold temperatures for several minutes. It can be done to one area of the body by using ice packs, ice massage, coolant sprays, ice baths, or through probes administered into tissue, or to the whole body by immersing the body into extremely cold air. Cryotherapy can help relive muscle and join pain, support weight loss, reduce chronic inflammation, and slow down cognitive decline. 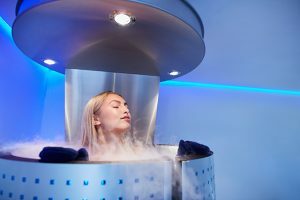 Cryotherapy may help treat mental health conditions, such as depression and anxiety, and cause physiological hormone response. Cryotherapy may help treat skin conditions, such as eczema, reduce migraine headaches, and numb nerve irritation. Cryotherapy supports the muscular, skeletal, immune, nervous, endocrine, and integumentary systems.